My job entails assisting Dr. Vanourny with all aspects pertaining to clinical procedures and to ensure all patients are made as comfortable as possible. I began as an assistant in 2008 and I have been working with Dr. Vanourny since 2012. I grew up around dentistry with my father owning a dental laboratory and my mother working in both dental offices and labs. My favorite part of my job is being able to make patients comfortable. It is very enjoyable being able to see patient’s through their total treatment and seeing their happiness with our care. I love the fact that every day I come to work and feel I am working with great, loyal and passionate people that are truly concerned for our patient’s health and satisfaction. In the fall of 2015 I was married, we enjoy spending time with our kids, hiking with our dog, going to the White Water Center and attending sporting events with family and friends. 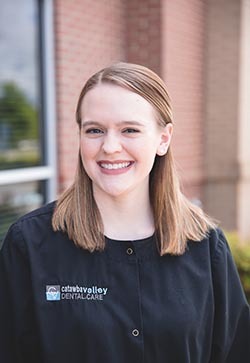 I graduated from Central Piedmont Community College in 2016 and joined Catawba Valley Dental Care immediately following graduation. 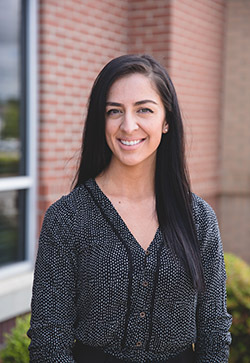 As a dental hygienist, I am responsible for taking xrays, evaluating gum tissues, cleanings and caring for patients with periodontal disease through scaling and antibiotic placement. My favorite part of my job is getting to know my patients and their families and helping them to achieve and maintain their health through proper oral hygiene. I really enjoy working with Dr. Vanourny, he does a great job of working with his employees and helping them to grow in their careers. You can tell he really cares about his team. 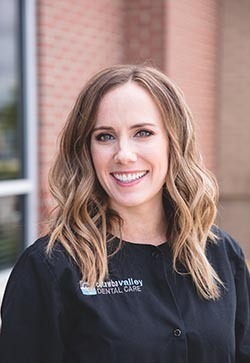 Our team at Catawba Valley Dental Care is excellent and we all do a great job of communicating and truly feel like a team. I was married in October of 2016 to my husband Michael. We really enjoy spending time together whether that is taking a fun road trip, or relaxing at home. In my spare time I enjoy sewing, crocheting and doing other fun crafts. 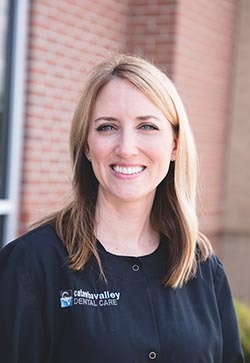 I graduated from York Tech in 2008 and after nine years in dentistry, joined Catawba Valley Dental Care in 2017. I am responsible for performing cleanings and treating periodontal disease. I also take X-rays, place antibiotics and sealants, and counsel patients on nutrition and home care. I love working at Catawba Valley Dental Care. Everyone cares so much for their patients and coworkers; it is very much like a family environment. I have been married to my husband Jon for six years. We have a son named Luke and two dogs. We enjoy boating on Lake Wylie, vacationing in Hilton Head, and spending time with family and friends. I attended York Tech for dental hygiene and have been in the dental field since 2005. My duties are performing cleanings and caring for patients with periodontal disease through scaling and antibiotic placement. In addition to that I also take x-rays, intraoral photos and counsel patients on oral hygiene and proper nutrition. My favorite part of my job is interacting with and educating patients on their oral hygiene. Dr. Vanourny is great to work with, he is easy-going, friendly and provides excellent care for our patients. I have been married for 7 years, my husband and I have 2 daughters and a cat. We love going to the beach, swimming and riding bikes with our kids. During my down time I enjoy reading, working out, shopping and spending time with family and friends. 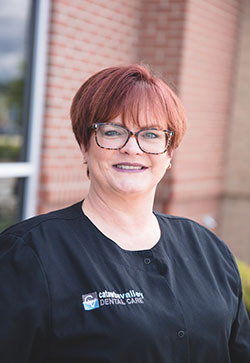 I joined the team at Catawba Valley Dental Care in March of 2018 and have been working in the dental field for 20 years. I love my job because I enjoy having a part in putting a smile on our patients faces and watching them walk out healthier and happier. I have one son and recently married, adding 3 bonus children and 2 bonus grandchildren. For fun I enjoy taking weekend trips. 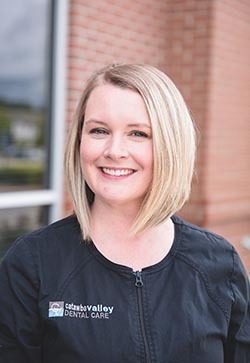 I am the scheduling coordinator at Catawba Valley Dental Care and joined the team in 2018. I am usually the first one you'll talk to when calling or coming to our office. The thing I like best about working here is meeting new people—our team here is very warm, welcoming, and helpful! I love being outdoors, traveling to new places, and reading! As financial coordinator, I help patients schedule their needed treatment and understand their insurance. 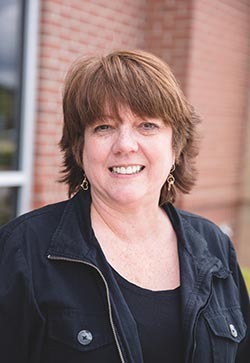 I have been working in dentistry for 20 years and joined Catawba Valley Dental Care in 2018. My favorite part of my job is helping people get their treatment scheduled and getting them on their way to better health. I am married to my wonderful husband Stephen and have three children and three grandchildren. I enjoy crochet, walks with my dog, and reading books.